For those looking for maximum performance and looks from there 6.7L Cummins then look no further than the beautiful yet functional H&S Performance intake manifold. Cast aluminum for a great fit, and powdered coated black for a long lasting finish. 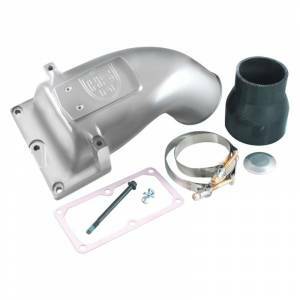 Let your truck breath 'soot free' with this intake manifold that removes the EGR valve and throttle valve assemblies in one shot. Note: This kit requires an EGR Cooler Delete (#301003 for 2007-2008 model year or #301005 for 2009-2012 model year) or a Crossover Tube Plug (#301015). Will cause a check engine light, unless used in conjunction with an H&S or equivalent Tuner.